Not Quite As Fun As Watching Fainting Goats. 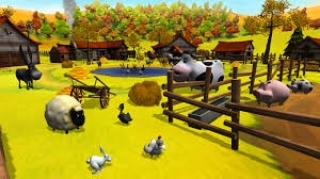 My Farm is a very light farm simulator for children that was previously released on the DS. The game has you starting out with just 1 hen and some pocket change and you must feed your animal, clean it, feed it medicine when it's sick, and earn money from selling things such as eggs that the animals produce! If you think this sounds easy, it is. The game as a whole is too simplistic and fails to draw you into the game, luckily, however I would say that the game's "target audience" of 10 and under would find this game relatively fun, so although I would give this game an F in this regards if I were basing it on how much I enjoyed this game, I realize that the target audience would likely enjoy this game so this review reflects that! 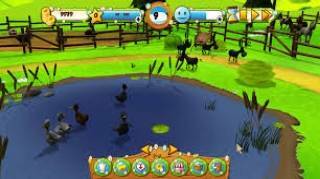 As for the controls they are quite easy to learn and take full advantage of the Wii U Gamepad's touch screen from feed animals, to sweeping a brush/broom to clean animals and the farm itself the controls are very responsive and are perfect for this type of game! The only negative I had with the Gamepad is the fact that there is no Off-TV play from what I could tell, but that is only a very minor complaint. The graphics in My Farm are, sadly quite bad. The character models are quite blocky and the farm itself is very lackluster looking. The game honestly looks like a bad looking PS2 game, but even though this hurts the game's review score it certainly isn't one of the most important aspects of a game so the score isn't greatly affected by the poor graphics. The music and sound effects on the other hand are decent and fit the game well, but for the most part aren't a memorable aspect of the game. With flawless controls and fitting music/sound effects this game does some stuff extremely well, and though the game might be extremely boring for older audiences it is likely fairly fun for its target audience! However, the lack of Off-TV play and extremely ugly graphics do hurt the game's score enough to drop it below "solid" status, but nonetheless the game does what it sets out to do and isn't shovelware to those who fit the target audience. Wow a 6.2/10? That is by far the highest review score that this game has received! It's because it's geared towards very young kids so clearly adults and teenagers won't like it that much. That is why I gave the game a 6.2/10 instead of a 5/10. Rukiafan wrote: It's because it's geared towards very young kids so clearly adults and teenagers won't like it that much. That is why I gave the game a 6.2/10 instead of a 5/10. Game look not fun. But review nice!